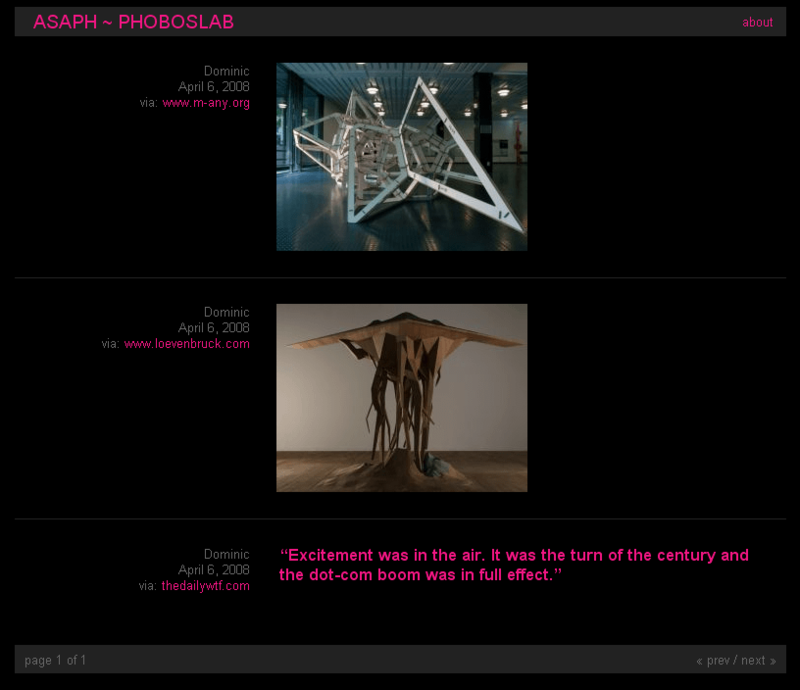 Asaph is a micro-blogging system, focusing on collecting links and images from other pages. It allows you to post content directly from any page you are on. Asaph is not a full blown blog and it does not aim to be one — it just does this one task, but it's pretty good at it. The alternative Stickney Theme also shows date and author information for each post and allows posting of longer texts. Feel free to modify these themes to your liking, or create new ones. Asaph needs PHP 5.0 or higher with the GD-lib installed and cURL or allow_url_fopen enabled. Also MySQL 4.0 or higher and an already created database is needed. To post entries to your blog, you'll need a good browser (read: anything not Internet Explorer). To install, enter your database and server settings in the asaph_config.class.php file. The settings you absolutely need to change are $domain, $absolutePath and $db. You also have the option to switch from the minimalist whiteout templates to the stickney templates by just replacing both occurrences of “whiteout” with “stickney” in the #$templates# setting. When done, upload all files to your server and make sure the data/ directory is writable — this is where Asaph stores all images and thumbnails. After that, point your browser to admin/install.php and follow the instructions. The only way to post new entries to your Asaph blog, is through a bookmarklet. After logging in to your admin menu, you will see the ASAPH bookmarklet on the left. Just drag this link to your bookmarks bar and you're set. Now, navigate your browser to any page you want and click your newly created bookmark. A small box should pop up and all images on the page should now have a dashed blue border (if not, see the FAQ). You can now either click on any of these images or on “Post this Site” to post the image or link. This can have several reasons. The most common one is, that your $domain and/or $absolutePath setting is not correctly set in the asaph_config.class.php. Refer to the installer (admin/install.php) it should tell you the correct settings for these values in the “Asaph Config” section. Another reason for the bookmarklet not working could be, that you disabled iframes in your browser. Some ad-block plugins do this. Most of the time this happens because Asaph wrongly detects the image URL. Maybe because the thumbnail is linked to an interstitial instead of the image itself. 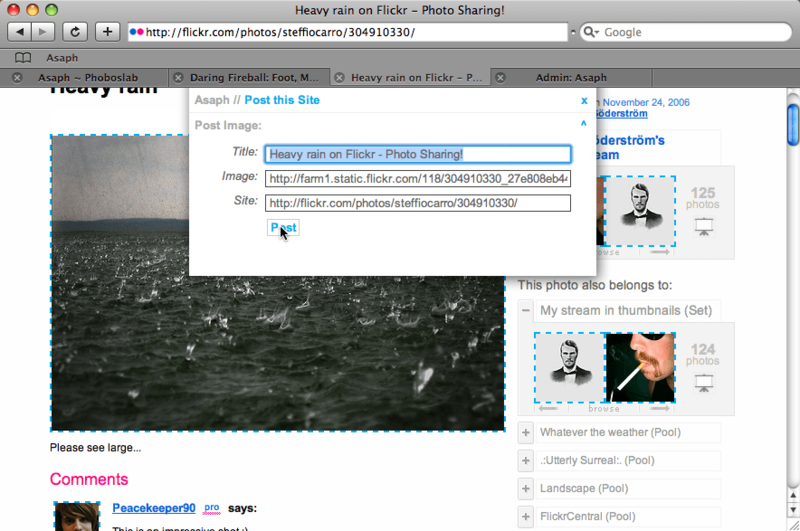 You can enter the image URL manually into the Image field if Asaph fails to detect it. Your server is not running PHP5 (see requirements). Ask Your hoster to update. Q: Why is your Blog named after a Biblical figure? Its not. Its named after Asaph Hall, who discovered the Mars moons Phobos and Deimos. Thanks to Nicolas Magnier, Nate Cook for some code contributions and countless others for all the helpful comments, bug reports and suggestions.